On Friday morning, I had the absolute pleasure of interviewing one of my favourite local heroines Tamara Cater Barker, the Founder of Epic Dance, in one of my favourite locations, the National Diving & Activity Centre in Tidenham Gloucestershire. I wanted to talk to Tamara about her company Epic Dance and hear the story behind this inspirational and community-focused business. Why did you start Epic Dance? Epic Dance started as the Wye Valley Dance School back in 2008, at the request of other mothers who knew that I had skills as a professional choreographer and teacher. My previous teaching experience had been mostly in Further Education, but also included A Level and GSCE dance. Teaching toddlers (aged 2 to 4 years old) requires a completely different approach and I needed to distill my previous work and scale it down to its simplest form. I was able to do this because of my training in dance movement therapy which uses movement to invigorate a person’s body and psyche. The more you expand your movement range, the more you literally grow as a person, and that isn’t just growing in a physical sense (balance, fitness, flexibility and coordination), it is also growth of emotional and psychological range. This is done using dynamics. Dynamics is the equivalent of the quality of movement; in musical terms we would use Italian terms for descriptors such as ‘loud, gentle, delicate, passionate’ and…. in dance this relates to how much power or lightness you put in your movement, how free flowing it is, as opposed to bound or controlled movement. This is part of the work which I studied in my post-graduate training at the Laban Centre in London. Working with Walli also linked to my experience of Intensive training in classical Indian dance in Gujarat. The Director of the school had also performed into her 60’s, and it seemed that within that art form there might be a place for acknowledging and revering the sophistication and understanding that comes with age. There were roles for mature dancers, and yet there is no easy parallel for that in dance in the West. As a child, I saw one of Margot Fonteyne’s final performances at the Royal Opera House alongside Rudolph Nureyev. It was seen as exceptional for a classical dancer to work into her 40s let alone her 50s because for a Western dancer when virtuosity in the body ends, value ends. This seems to me to be a very shallow interpretation of what dance can be. As a teen, I saw Merce Cunningham perform in his 60’s and was quite was mystified when a small, skinny arthritic man hobbled onto the stage and everyone around me applauded him. As I watched him move, and in conversation with my Mother afterwards, I came to realise that I was witnessing a great mind in motion. In dance I believe a creator can keep creating regardless of their age. 10 years’ of Epic Dance. To be at this stage of my work in Epic dance 10 years on, I feel that my physical capacity to demonstrate movement is precious and valuable but not infinite, so my school is at a place where I am training young people who studied with me and have absorbed and integrated the teaching I have to offer, to become my apprentices, and now they often demonstrate and embody my choreography for me. I feel extremely touched at the care that they put into retaining and treasuring the dances that they have learnt with me over the years and are now teaching to their younger peers. Often they remember it more accurately than I do, and that is how we are building a very rich repertoire of Epic Dance works which are all tied into the hopes and dreams, music and literary favourites of children and young people. Tamara has taught over 600 students and also a third of her original cohort from the age of 4 are still with her at age 14! What a remarkable achievement! Why the Heroines (and Heroes) Theme? When I was first creating the work for toddlers, 10 years ago, my eldest child was still a baby. As my children became toddlers, pre-schoolers, and now primary school children, my work and influences have been around their world of reading, the programmes they are watching on CBeebies and CBBC, the movies they love and the heroes and heroines of the tales they read. So my work is contemporary and completely immersed in the life stages of my children and students. Fairy Tales have probably been the biggest influence as they run deeply in the group psyche of our society. For example, Cinderella suffers the nightmarish horror of being exposed in all her vulnerability, when the magic that has been supporting her disappears at midnight. She is simply a poor girl, without servants or carriage and would her prince love her? Moana is a timeless heroine who literally breaks through the barrier reef to go on an adventure to save her community. One of the reasons that I love Moana is that it points to a concept that not all development is about reaching forward on a linear timeline; most of her development comes from digging deeper and linking to her ancestry. Similarly I believe there is ancient wisdom in our bodies and that that can support the way forward for humanity: if we are to pull together as a team to save our shared earth, we need to dig deeper and revisit our inner wisdom. On a Radio 4 programme recently, I heard a discussion exploring how the virtual world is exacerbating the disconnect between the mind and body, and how this might particularly affect our children. So, more than ever now, it is vital for young people, and those who are meandering through the endless circles of technical distraction, to come back to themselves. What better way than through movement and the absolute joy of our bodies in motion, bodies which we have been given, and are arguably the only physical entity we truly own in our lifetime! I believe there is a huge connect between artistry and healing and that is how I have been able to sustain my business. 8 out of 10 businesses fail in the first 18 months according to Bloomberg (https://www.bloomberg.com/europe) and what an achievement it is to still be thriving as Epic Dance heads into its 10th year. I have to say Epic Dance has flourished because it is an extraordinary business and Tamara makes the impossible happen. Dance and movement is in her DNA and to be able to translate this innate inner talent to enormous and impressive productions is phenomenal. Tamara is ahead of her time and her work is outstanding. Not to mention the costumes which are all handmade and the children and students who are inspired, engaged and exuberant. Tamara is one of my biggest inspirations and Epic Dance is an exciting and relevant business. 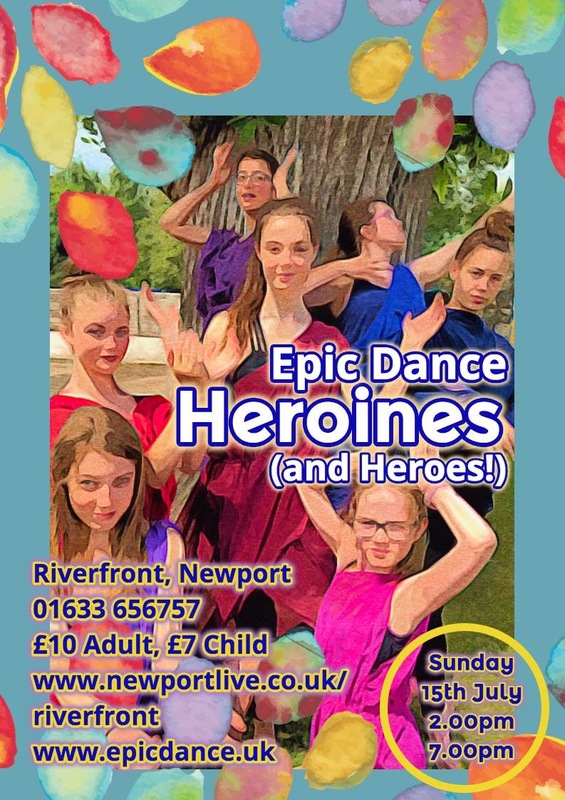 Epic Dance are performing in their biggest venue ever The Riverfront in Newport. You will see a diverse programme of dance including the tales of classic heroine Cinderella, timeless Heroine Moana and a team of Guardians who rise together to protect children from the Bogeyman and his Night-Mares. From Greek Goddesses to modern girls, the show is ultimately a celebration of uniqueness and diversity in our own dancers, true EPIC dance Heroines and Heroes, whose stories have just begun with so much still unwritten. EPIC Dance Heroines (and Heroes) is performed by dancers aged 3 to 23, and celebrates a decade of dance in the Wye Valley. 2.00 p.m. and 7.00 p.m.
Tickets £10 adult and £7 child.